Striving to bring you the area’s best prices, best service and best guarantees! for the Same Great Service! FREE DOUBLE DOSE OF POOL SHOCK! AND NO EXTRA CHARGE FOR POOLS WITH SPAS! Most companies charge anywhere from $ 40—$ 75.00 for these services! when you let The Pool Store open your pool! Visit our Online Shop and save! 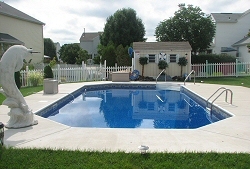 Includes all of the following: Removal of Winter Cover, Clean & Fold Cover, Removal of all Winter Plugs, Re-Assemble Pool Filter System, Installation of Existing Pool Equipment, such as: Dive Boards, Handrails, Ladders, etc., Installation of all Skimmer Baskets, Return Fittings and Automatic Pool Cleaner Fitting (if applicable), Start-Up Filter System, Add Initial Start-Up Chemicals & Check Overall Pool Operation. Includes all of the following: Removal of all Winter Plugs, Re-Assemble Pool Filter System, Installation of Existing Pool Equipment, such as: Dive Boards, Handrails, Ladders, etc., Installation of all Skimmer Baskets, Return Fittings and Automatic Pool Cleaner Fitting (if applicable), Start-Up Filter System, Add Initial Start-Up Chemicals & Check Overall Pool Operation. Includes all of the following: Removal of Winter Cover, Clean & Fold Cover, Removal of all Winter Plugs, Re-Assemble Pool Filter System, Installation of Existing Pool Equipment, such as: Walk-In Steps, Handrails, Ladders, etc., Installation of all Skimmer Baskets, Return Fittings and Automatic Pool Cleaner Fitting (if applicable), Start-Up Filter System, Add Initial Start-Up Chemicals & Check Overall Pool Operation. Walk-In Steps, Handrails, Ladders, etc., Installation of all Skimmer Baskets, Return Fittings and Automatic Pool Cleaner Fitting (if applicable), Start-Up Filter System, Add Initial Start-Up Chemicals & Check Overall Pool Operation.